Today was one of those really drab days that would be good for a run because there was a light mist but I did my long run yesterday and I am competing in a 5K tomorrow so today was a none run day (did you get all that, cause I did it in one breath!). Anyway, I had to find other things to do to keep me busy, which is not difficult because I have not been home for a Saturday in quite some time. So where did I end up? My closet! What did I find? 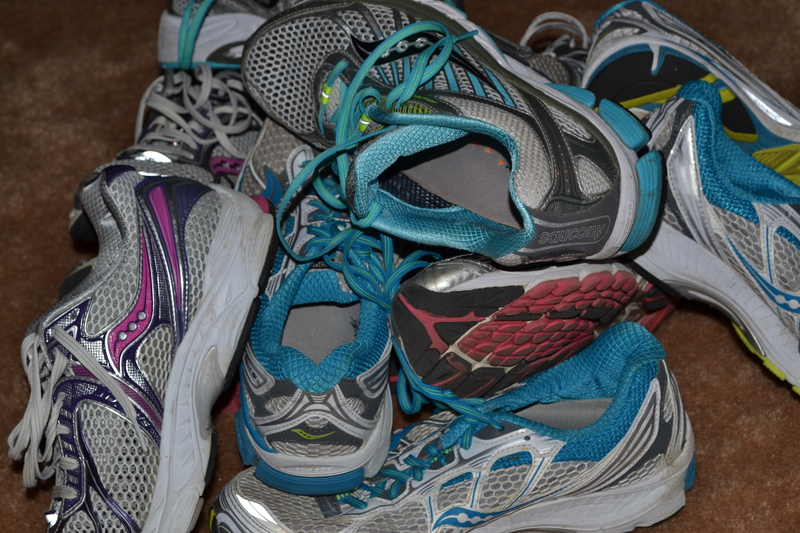 An overabundance of running shoes. I know this should not shock you but it’s not like I am a professional runner and getting paid or even sponsored by Saucony but I am thinking I should be! Maybe not a professional runner but being sponsored by a running shoe company might save me some good money (if you have any hints on how to do this, please let me know. I love free stuff and I would whole heartedly provide my feedback to them through this blog). Anyway, it was fun to look at the past few years in running shoes and see not only how the shoe has progressed but how my running has progressed. By that I mean how I started with a lot of padding in the shoe and have progressed down to not that much and now I enjoy a much lighter shoe that is not overly padded (no I am not into the barefoot shoe just yet but I have tried a couple of miles barefoot on the treadmill). Now I have all these shoes and I keep meaning to take them to the running store because they have a box for recycling them which I love but I never remember to bring them. So instead I think I am going to take them to my local Goodwill thrift store so someone in my community can benefit from my expensive running shoe habit. I often struggle with the benefit of donating to a cause local or outside of my area mainly to other countries. It’s not that I don’t want people to benefit in other countries; it’s that I witness so many struggles locally on a daily basis that keeping it local sounds like a better idea. Okay, so I really don’t have a problem but I do have a lot of running shoes. I’m sure all of us runners have the same issue too. What do you do with your shoes? Ever thought about donating them locally?